We are the #1 Dealer of Bag-A-Nuts! Our classic design that is loved by so many of our customers! 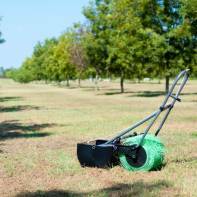 The 12" Nut Harvester is our only design that features a "pull cord" design. Push the nut roller over your harvest, watch the magic finger design grab the nuts and eject them into the collection basket. Once ready to empty your harvest, don't bend down and strain your back! Just pull the cord attached to the lower handle and watch as the nuts are easily released. Made in the USA product is our classic model and a best seller! Pros: Excellent job picking up acorns. Easy to use. Ordered on a Monday and received on Friday. Put together which took maybe 3 minutes and used on Saturday. Does a great job with the acorns. I was very impressed with how thorough a job it did. My only regret is that I didn't get the 36". Was skeptical when I ordered so went with the smaller one. After using I am definitely going to be ordering the 36". Great product. Great company.